Thefts have occurred in Warburg, Alberta Beach, Grande Prairie, Slave Lake, Onoway, and Leduc. RCMP are investigating a string of ATM thefts across northern and central Alberta over the last two months. In almost every case, two or three men drove a pickup truck through the window of a business, and then dragged the ATM with a rope or strap attached to the vehicle. RCMP responded to the most recent event around 5:15 a.m. Wednesday. 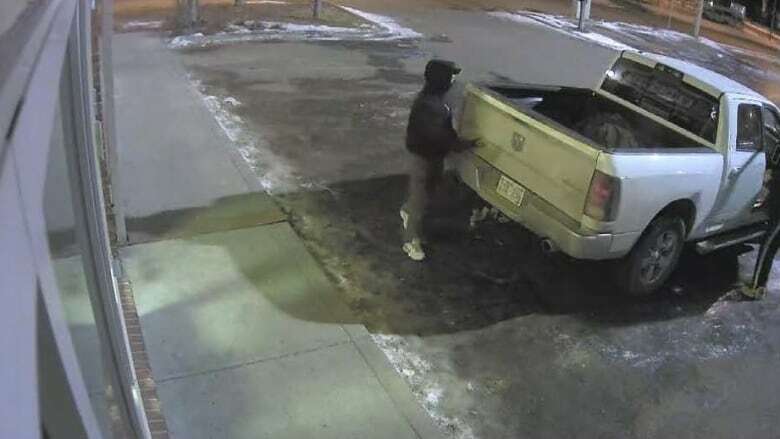 Thieves pulled an ATM from a Money Mart on 50th Street in Leduc using a strap attached to a truck. Police were alerted when the alarm went off. "When we arrived, we found the front door had been broken open," said Cst. Julian Celms. Scrape marks were visible on the floor. Surveillance video reveals more details about the theft. One of the men appeared to be wearing a blonde wig to disguise his identity. Celms said this the first time this has happened in Leduc. He is hoping anyone who heard or saw something will come forward. "I have no doubt there was someone around who might have heard this," he said. "This is something that would have caused a commotion and some noise."